President Donald Trump suggested on Monday, March 12, that another tax-cut bill is in the making. 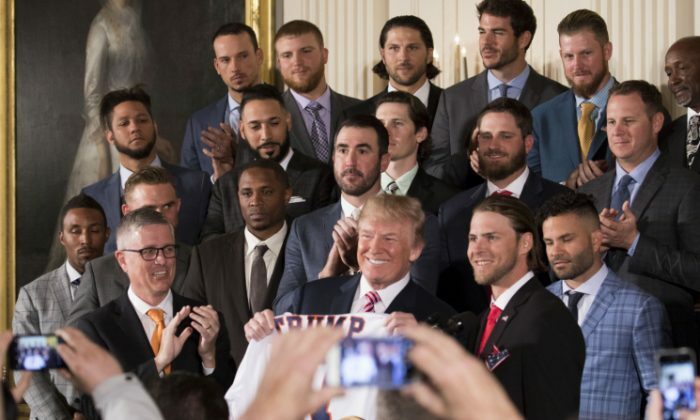 The president made the revelation as part of seemingly impromptu comments to Rep. Kevin Brady during the Houston Astros White House visit. Brady was one of the architects of Trump’s historic tax-cut bill, which slashed taxes on businesses and for more than an estimated 90 percent of working people. Americans began seeing bigger paychecks in February and March as a result of the cuts. After Trump signed the first tax-cut bill in December last year, more than 400 companies, including Walmart, Comcast, AT&T, Walt Disney Co., Starbucks, American Airlines, and Bank of America, publicly announced tax-cut bill-related bonuses, pay increases, or retirement fund hikes. To date, more than 4 million working Americans have received or are set to receive these bonuses, according to Americans for Tax Reform. Shortly after the first tax-cut bill was passed, Brady indicated that a second bill may be necessary to make technical corrections. “I can’t imagine any major undertaking like this that doesn’t require technical corrections in the future,” Brady said back in December, according to Business Insider. The tax-cut bill is part of Trump’s wide-ranging effort to revive the U.S. economy and bring back American jobs. Among other efforts, the president’s administration is cutting regulations at a record pace since Trump took office. The president’s efforts are paying off. The unemployment rate is at a 17-year-low, consumer confidence is at a 17-year-high, and more Americans have jobs than ever before in U.S. history.